Since the beginning, people have told stories of the monsters that stalk the night, lurking just beyond the town wall or the village's edge. These are the creatures of myth and legend that have stood the test of time, which have entered everyday language and remained cultural touchstones for thousands of years. Now the Pathfinder Roleplaying Game goes hunting for 10 of these classic monsters, culled from among the greatest stories ever told. Mythical Monsters Revisited explores the lives and societies of the most famous monsters of all time, drawn from the mythology of the ancient Greeks, Egyptian, Aztecs, and others. Each monster entry features an extensive ecology exploring the creature's biology and culture, notes on the monster's real-world background, tips on how best to utilize the beast in our game, detailed overviews of the monster's role in the Pathfinder campaign setting, and more. Medusas, the snake-headed banes of ancient Greece, who turn their enemies to stone with a glance. Hydras, the many-headed serpents that grow two new heads for each one they lose. Four types of sphinxes, from the riddle-loving gynosphinxes to the philosophical androsphinxes, the goat-headed crioshpinxes, and the evil hawk-headed hieracosphinxes. Couatls, the feathered serpents of Aztec myth who serve as messengers and servants of benevolent gods. Other ancient terrors such as flesh-hungry wendigos, three-headed chimeras, leonine griffons, and the horrifying intelligent sea monsters called karkens. 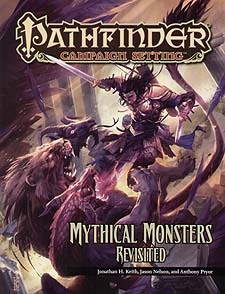 Mythical Monsters Revisited is intended for use with the Pathfinder Roleplaying Game and Pathfinder campaign setting, but can easily be used in any fantasy game setting.